Too many grapes in the garden? Here's recipes for making your own grape juice and grape jelly, along with a couple of other grape recipes from a 1950's cookbook, and some Elderberry wine. If I find anything else about what to do with grapes, I'll post it here. Need to preserve some grapes? Here's some recipes for Canning Grapes. Wash 10 lbs Concord Grapes, and put in an enamel pan Barely cover with water. Cook slowly, stirring to prevent sticking, until the grapes are soft. Strain. Return juice to heat and add 3 lbs of sugar. Let it come to a boil. Pour into hot, sterilized bottles or jars and seal. 2. Into hot sterilized quart jars place a heaping cupful grapes, and 1/2 cup sugar. 3. Fill the jar with boiling water and seal at once. Note: It is well to let the jars set in the hot water you used to sterilize them, while you fill and seal them. Set away in cool place for six weeks before using. My Note: I picked up an old church cook book from 1945 at the thrift store and this recipe is in it. Seems very simple. Cover grapes with water and boil until broken, strain through cloth. To every 5 cups of juice, add 1 cup of sugar. Heat until sugar is dissolved. Put into sterilized bottles and cap. Nectar of the Gods... About 1 bushel of dead ripe Concord grapes or wild summer grapes. Wash grapes on stem and pick off. Mash in a stone jar. Stir in 5 oz. tartaric acid. Let stand overnight (no water is added). Squeeze and drain until 1 gallon of juice is obtained. Stir in 10 lbs. sugar and stir for 10 min. Put in jars but it is not necessary to seal. Dilute with water and chill before serving. Thaw grape juice. Pour into a 1 gallon glass jug with small opening. Add sugar, yeast, and stir well. Add enough water to come to just below the neck of the jug. Put a large balloon over the neck. Fasten with a rubber band wrapped around the neck. The balloon will expand to full size and usually return to the original size. Keep at room temperature at all times. Usually takes 4 to 6 weeks. The picture was taken at 3 weeks. Use 2 cups warm water to dissolve juice, sugar and yeast. Pour into 1 gallon container, and fill the rest of the way with water. Tie a sturdy balloon over the top of container. Store in a warm place. The balloon will rise. 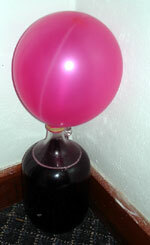 When it goes back down (in a week to 10 days) remove balloon and cap the jug. Store in a warm dark place. Pick and wash grapes, mash and let stand from 3 to 4 days. Keep covered with cheesecloth. Strain. To 3 gallons of water add 2 gallons of juice. Dilute 10 lbs of sugar in the water. Put only enough water with the berries to keep them from burning and cook but a few minutes, just long enough to scald thoroughly. Strain through a cheesecloth, add eight cups of sugar to 10 cups of berry juice. Set away in a cool place to ferment and skim daily until clear. When bubbles cease to rise on top of the liquid, it is ready to bottle. Use only white sugar and you will have some of the richest flavored wine you ever tasted. Yeast is apt to sour the wine and it is a mistake to hurry the fermenting process. The addition of other liquor spoils the fine natural flavor.